"...during initial set-up defenders will be able to deploy a modest range of defensive works to help them resist the coming tide." 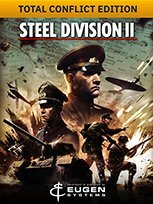 Joe Robinson has news about an interesting upgrade to Steel Division II. Apparently, Joe really likes his fortifications: "...the best way to a man’s heart is through a carefully sighted and designed trench system."